There has been a lot in the popular press lately about so-called Lone Wolves. It seems that they are not as alone as we thought. This is partly because we in America experience a certain amount of laziness with our language. Some people learn what words mean in school by referring to dictionaries and then rigidly insist on using those same definitions throughout their lives as they apply those definitions to the words they hear. Other people use inductive reasoning and learn what words mean by listening to how they are used. It doesn’t help matters that dictionary editors give credibility to the second group when they update their dictionaries. In the case of Lone Wolves (as referring to guys who act on their own to commit violent random offenses), there simply is no clear definition and thus all points of view as to it’s meaning are equally valid. So, it is pointless and intellectually stupid for Fox “news” commenters to argue incessantly about whether a particular Jihadi is a Lone Wolf terrorist or a work place violent psychopath. Those are not mutually exclusive categories. The whole point of applying labels in the first place is that there are important and credible distinctions between the groups that helps you in determining how you will deal with each. if you treat them all the same, then it doesn’t matter what you call them. If you treat them as criminals, then their crimes need to be defined under law and their label is the label that is spelled out in the legislation. If you treat them as mentally defective then you formulate a course of treatment that involves education, brain chemistry, hypnosis, or some other such things. You will notice that I have not used the word “terrorist” anywhere on the chart. That is because “terrorist” is not a useful label. Terrorism is a tactic. A terrorist is someone who uses that tactic. The choice of tactics does not define who a person is. What can we see from the chart above? 1. Most Moslems are indistinguishable from psychopaths. This is why they are incompatible with living peacefully with their neighbors and incompatible with living in the modern world. 2. 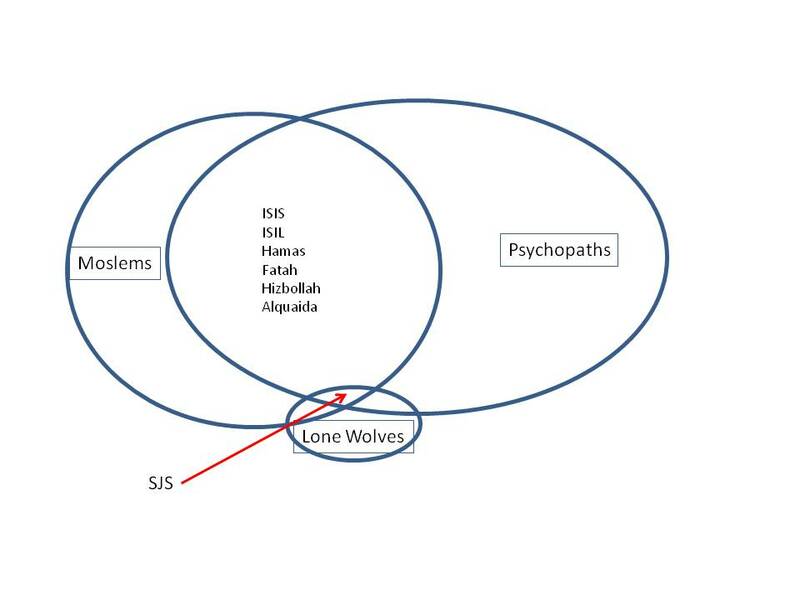 The tiny area labelled SJS is for “Sudden Jihadi Syndrome”. Those are the guys you see that suddenly and for no apparent reason go postal and attack police officers with an ax. This is Nidal Hassan, Underwear bomber, Ottawa attacker, Boston Marathon bomber, and a host of others. The US federal government is almost entirely focusing it’s efforts on stopping the Lone Wolves, but not the dangerous psychopaths or the Islamic Lone Wolves. Just the non-violent white guys. How does that make any sense? The truth is, that is a very ineffective use of resources. The non-violent group of Lone Wolves is unlikely to ever commit crimes other than ignoring federal regulations whenever it suits them. But our government is being run by a large group of people whose only skill is managing elections, not governing. So, they craft their language and select enemies that are easy to make a show of doing something about, but who are not really a serious threat to anyone. They are a make-believe enemy because real enemies are too scary and too much work for people who have no experience or inclination to take on hard tasks like defending civilization. For the political class, it is all about the next election. It is all about getting and keeping power. It is all about stage presentation. They couldn’t care less about how the world really operates. The SJS will continue to happen. There is no way to effectively stop them. Even if you eliminate Islam as a factor, the person is still a Psycho. Similarly, you can’t do anything about school shootings. Even if you eliminate guns as a factor, you still have some students who are off their meds. Calling people “terrorists” is not a useful label. It’s just a way to label them as the enemy without doing the hard brain work of defining why they are the enemy and what steps you are willing to use to mitigate them. This entry was posted in Crazy, Islam, Terrorists, War. Bookmark the permalink. So terrorist is like environmentalist or feminist? Just a word to describe an evil thing nobody is doing a damned thing about? Even less. It is just a word to describe people you don’t like. Unrelated to doing anything about them. At least feminist and environmentalist are descriptive of some identifying characteristic that is useful in understanding the person so named. “Terrorist” means nothing. But 500 pounds of explosives in the basement of an apartment building, you are a terrorist. Put it on the roof, you are a US Air Force Pilot. It’s like calling them racist. It means nothing.